Qualcomm is not giving up on its dreams of powering the laptops of the future, having just announced the Snapdragon 8cx system-on-a-chip (SoC) during a press event held in Hawaii. This new SoC was built exclusively for computers, particularly laptops and tablets, and aims to right a lot of the wrongs done by Qualcomm’s previous two attempts to bring ARM-based computing to the PC. For those more familiar with PC processors, an SoC is exactly how it sounds: nearly an entire system’s worth of computing technologies crammed into a single chip. That includes not only compute cores but graphics cores as well as, in this case, an LTE modem and a special processor for machine learning tasks, the Hexagon 685 digital signal processor (DSP). This is Qualcomm’s big moment, its third chance to truly nail applying silicon manufacturer ARM’s processor architecture to the PC space. We expect to see marked gains in both performance and battery life from this SoC, as Qualcomm promises. Here’s everything we know so far about the Qualcomm Snapdragon 8cx. The rear portion of the Qualcomm Snapdragon 8cx. Processor. First off, the most important thing to know about the Snapdragon 8cx SoC is that it holds the first 7-nanometer (nm) processor to be released for laptops and Windows tablets: the octo-core Kryo 495. For the record, neither AMD nor Intel have achieved a 7nm process, with Intel in a distant third having yet to release 10nm processors. This allows Qualcomm to cram more transistors into its processor than either of its competitors, which generally translates to stronger performance. Specifically, the Kryo 495 CPU comes with a larger memory cache than previous generations, though Qualcomm has yet to say exactly how much larger it is. Regardless, this should show an improvement in multi-tasking, according to the firm. One piece of the Kryo 495 that Qualcomm has been mum on is the clock speed or frequency, measured in hertz. However, we do know that the processor is, of course, based on manufacturer ARM’s big-little compute system – upon which the 8cx is built – that contains both high-density and low-density cores for different tasks. However, we know much more about what this processor enables in terms of supporting technologies. That includes up to 16GB of 8-channel DDR4 memory, NVMe solid-state drive (SSD) storage – the fastest standard available in laptops – and UFS 3.0 (a hybrid storage format between NVMe SSDs and eMMC). Finally, 8cx at last supports Gen 2 USB-C 3.1 and the third-generation PCIe connection format for compatibility with all the latest accessories. Graphics. On the other hand, Qualcomm has a lot more to say regarding it’s new-and-improved graphics processor: the Adreno 680 GPU. Right off the bat, we know that this version is twice as powerful as the previous version used for laptops, the Snapdragon 850, and 3.5 times as much as the Snapdragon 835, the first of its kind to be used in a laptop. Qualcomm is also proud to tout that the Adreno 680 is 60% more power efficient than the GPU inside the Snapdragon 850. That, coupled with the efficiency gains of the CPU, is expected to drive longer battery life, but more on that in a bit. The Adreno 680 also contains twice as many transistors and twice as much memory bandwidth as the previous generation. Qualcomm’s GPU also supports the latest DirectX 12 framework from Microsoft for improved rendering. Finally, this GPU brings multiple improvements to general visuals, like a high-efficiency video encoder, support for the latest H.265 video codec used across the web, 2nd-generation HDR support for real-time color correction, and the bandwidth for up to two connected 4K HDR monitors. Connectivity. 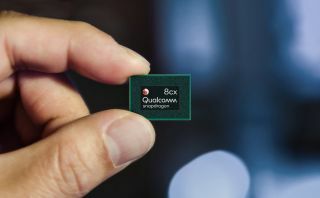 The 8cx uses an entirely new modem from Qualcomm for LTE, Wi-Fi and Bluetooth connectivity: the X24 LTE Modem. Over LTE, this modem enables download speeds of up to 2 Gbps (up to 316 Mbps uploads), and Qualcomm promises up to 70% improved throughput in poor network conditions. The modem also supports a gaggle of cellular connection protocols, including GSM, CDMA, EV-DO and both LTE FDD and LTE TDD – among several others. Of course, this modem allows for the Connected Standby mode that’s central to the Always Connected PC initiative. Also included in the modem is support for up to 802.11ad Wi-Fi, which includes AC, with MU-MIMO for managing multiple connections and multi-gigabit speeds. Finally, Bluetooth 5 as well as near-field communication (NFC) are supported. Battery life. Sadly, for as much as Qualcomm is shouting about the various improved capabilities found within 8cx, it hasn’t said much about longevity beyond that it can achieve ‘multi-day battery life.’ This is more than likely because so much of battery life figures depends on the device at hand. That said, we’ve scoped that Qualcomm has rated the 8cx for up to 20 hours of continuous connectivity over LTE. So, while we don’t know much more in specific, it would be safe to expect laptops that can last upwards of 20 hours when this SoC releases in 2019. The Qualcomm Snapdragon 8cx sitting on a wafer. Unfortunately, Qualcomm has said nothing regarding the release timing for Snapdragon 8cx. This is more than likely because the firm is leaving that question to be answered as soon as the first device maker debuts a product with its SoC inside. That said, because of this announcements imminent proximity to CES 2019, it would be safe to expect to see Snapdragon 8cx make its debut within a few laptops and Windows tablets to be seen at the show. In short, early 2019 is the most triangulation we can give on this. A Qualcomm Snapdragon 8cx laptop reference design. To be frank, the Snapdragon 8cx will only be as impressive as the hardware that envelopes it. If we’re looking on the bright side, device makers have set a low bar to surpass, judging by the first-ever Snapdragon Windows devices. So, here are some laptops we hope to see with the 8cx inside. Asus NovaGo. This gem from Asus held the promise of an LTE-connected notebook for the price of most other mid-range laptops. While it technically delivered on that, the build quality was questionable and the performance was poor, to say the least. We’d love to see Asus and Qualcomm return to the drawing board on this one with 8cx inside. HP Envy. The Envy x2 from HP came with the Snapdragon 835 as an option, which was ultimately its downfall. The Snapdragon 835 simply couldn’t deliver the performance required, despite its luxury trappings within an otherwise excellent tablet. HP and Qualcomm wouldn’t have to do much to elevate this Snapdragon Windows tablet to the next level. Lenovo Yoga. The Yoga C930 from Lenovo just debuted in late 2018 with the Snapdragon 850 inside. While we’ve yet to go in-depth with the laptop, surely introducing 8cx would only make this laptop more capable and powerful. We wouldn’t expect to see a successor to this one until late 2019, sadly.